Jelle Bruning, Ph.D. (2014), Leiden University, is Assistant Professor of Middle Eastern Studies at that university. 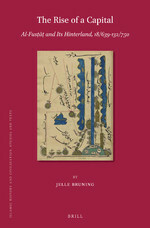 In The Rise of a Capital : Al-Fusṭāṭ and Its Hinterland, 18/639-132/750, Jelle Bruning maps al-Fusṭāṭ’s development from a garrison town founded by Muslim conquerors near modern Cairo (Egypt) in c. 640 C.E. into a bustling provincial capital a century later. Synthesising contemporary papyri, archaeology and narrative sources, this book argues that al-Fusṭāṭ’s position in Egypt changed with the different policies of the Rightly-Guided and Umayyad caliphs and their provincial representatives. Because these policies affected the town’s centrality in the administration as well as in commercial and legal networks throughout Egypt, from Alexandria in the north to Aswan in the south, The Rise of a Capital offers valuable new insights into Egypt’s society during the first century of Muslim rule.